New! 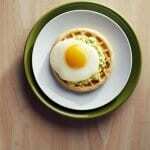 Avocado and Egg Waffle Topper | JPMA, Inc. Try a different take on avocado toast. This version tops toasty waffles with an easy guacamole and a fried egg. In small bowl mash avocado. Stir in yogurt, hot pepper sauce and garlic powder. Set aside. Heat large nonstick skillet coated with cooking spray over medium heat. Carefully break eggs into skillet. When whites are set, add water. Cover skillet and cook for 3 to 4 minutes or until yolks begin to thicken. Meanwhile, toast waffles according to package directions. Spread avocado mixture on waffles. Slide one egg on each. Serve immediately.